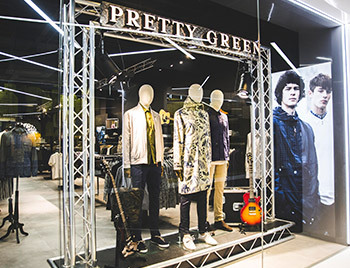 Our new Birmingham Store opened its doors last week- with an official launch and DJ set on Friday from Steve Cradock. The new store is located at Link Street, Bull Ring- in the link area between the new Grand Central Station and The Bull Ring. The new store has been newly refurbed with our brand new store concept. Stage Rigging window feature- bringing the stage production to the store. Vinyl shelves take centre stage - Over the last 2 years we've taken a real interest in the resurgence of vinyl growing our selection of vinyl stock online and within our stores. Its all in the details- flight case accessories storage adds a backstage vibe. The new Birmingham store plan to regularly host DJs and live music. Head down to see our exciting new store concept and to find your classic PG staples as well as our Spring Summer new arrivals.